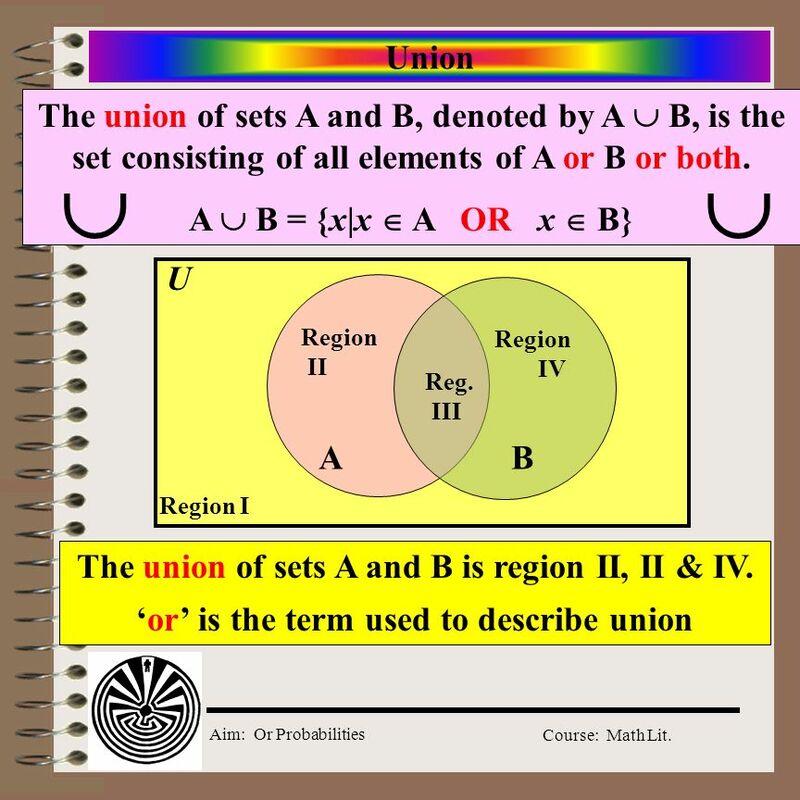 Aim: What are ‘Or’ Probabilities? 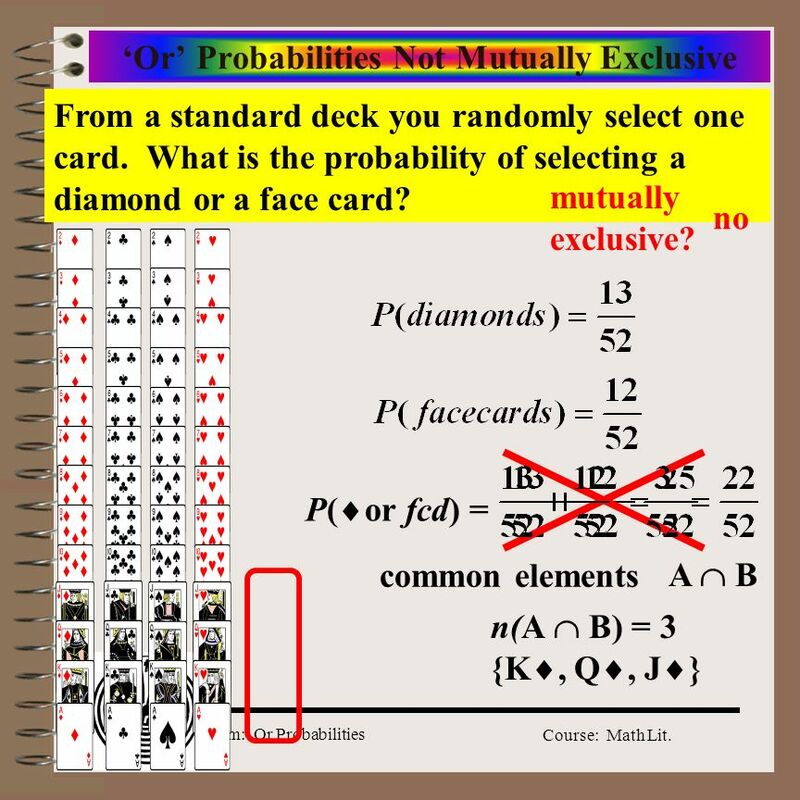 1 Aim: What are ‘Or’ Probabilities? 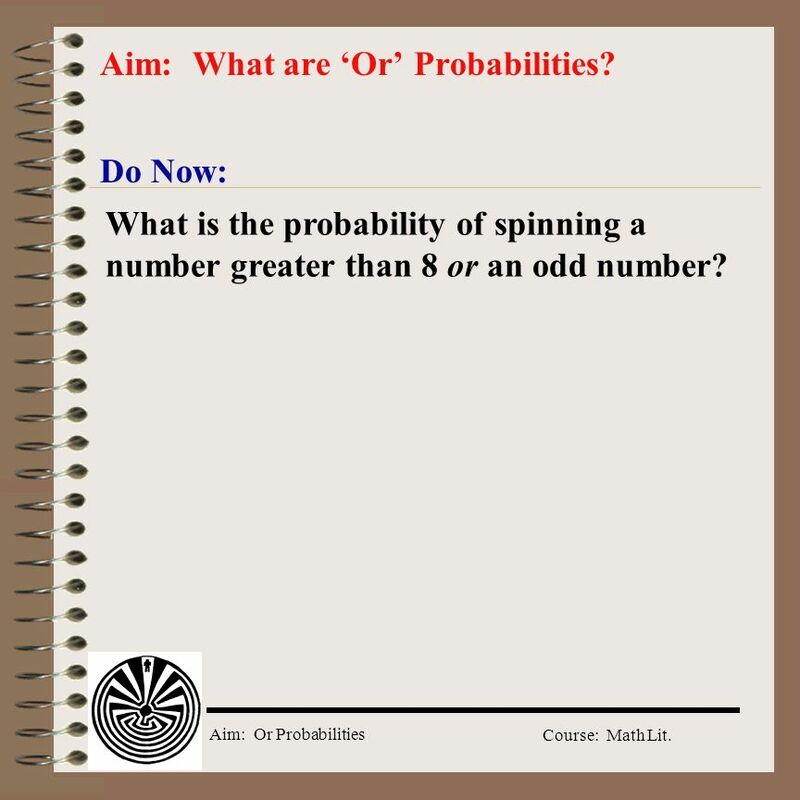 Do Now: What is the probability of spinning a number greater than 8 or an odd number? 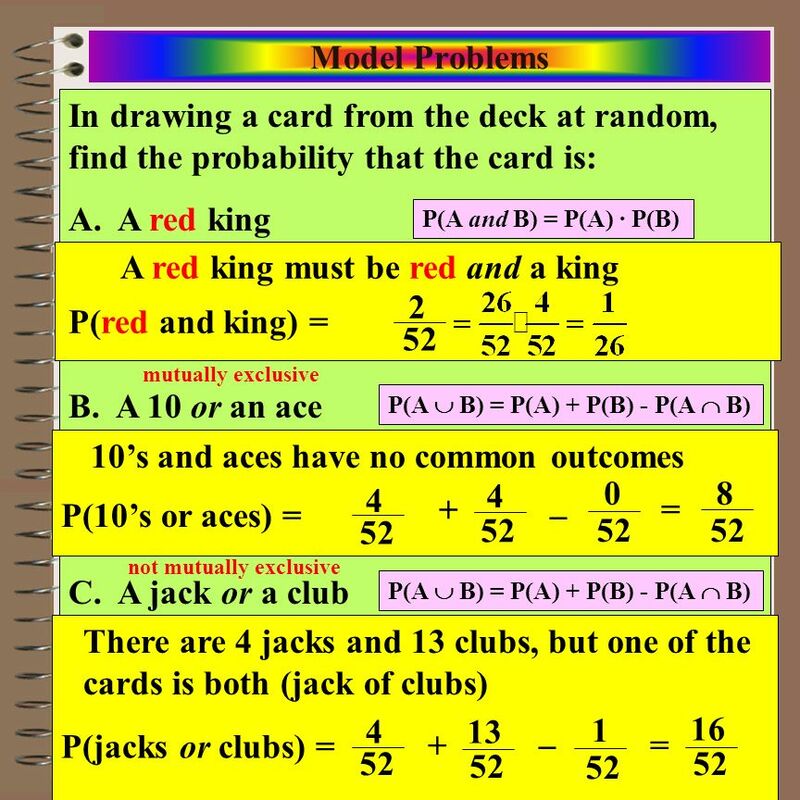 13 Probability Rules 1. The probability of an impossible event is 0. 2. The probability of an event that is certain to occur is 1. 3. The probability of an event E must be greater than or equal to 0 and less that or equal to 1. 4. P(A and B) = n(A  B) n(S) 5. P(A or B) = P(A) + P(B) - P(A  B) 6. P(Not A) = 1 - P(A) 7. 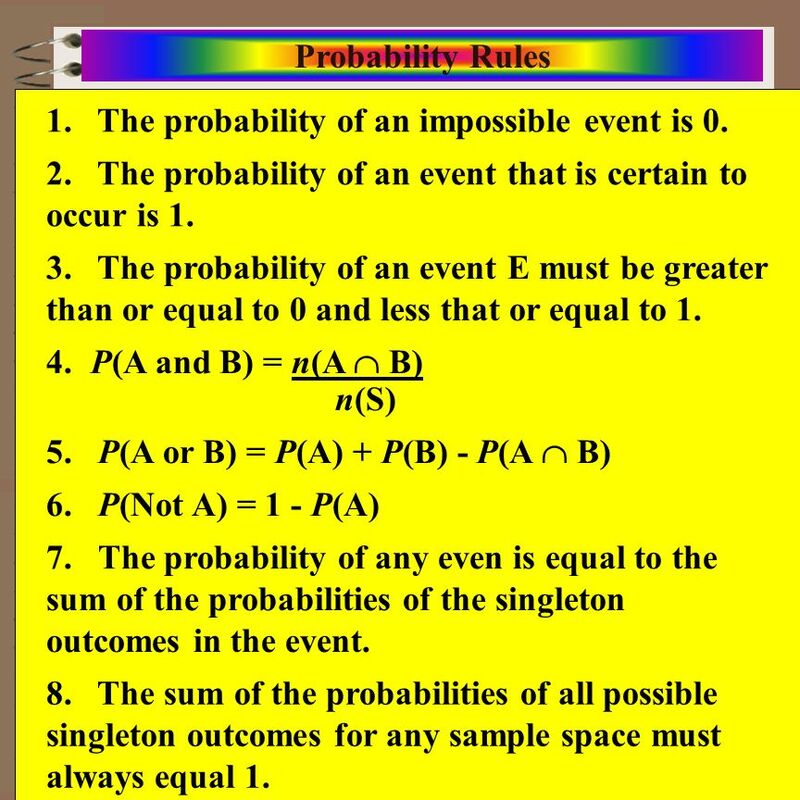 The probability of any even is equal to the sum of the probabilities of the singleton outcomes in the event. 8. The sum of the probabilities of all possible singleton outcomes for any sample space must always equal 1. 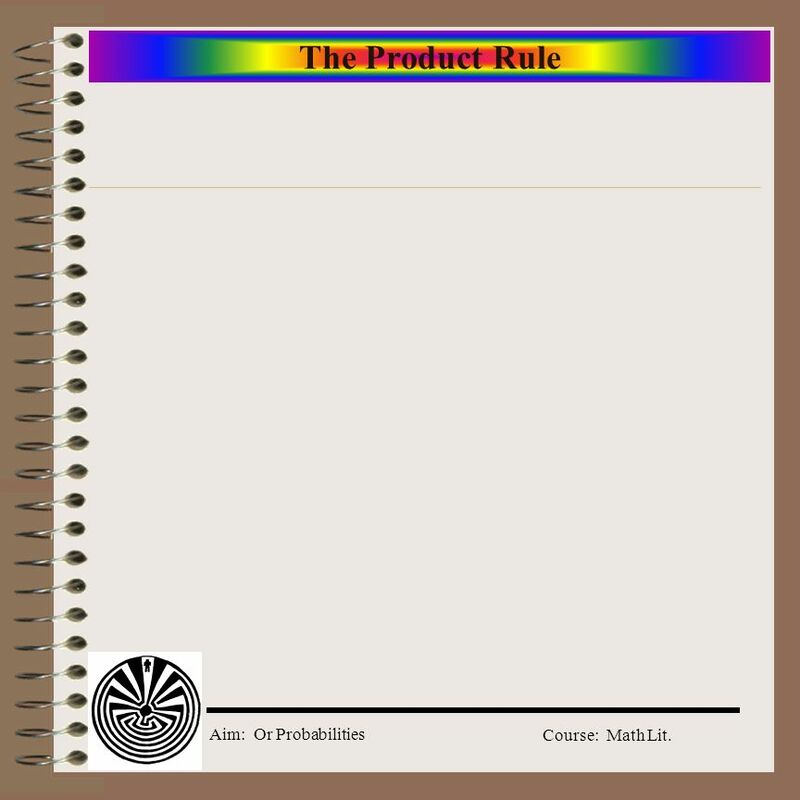 Download ppt "Aim: What are ‘Or’ Probabilities?" Aim: Probability! Probability! - How do I count the ways? Homework Answers 9) 6/24 + 6/24 = 12/24 or ½ 11) 12/ /24 = 24/24 or 1 23) P(2 and A) = (1/6 * 1/5) = 1/30 P(2 and B) = (1/6 * 1/5) = 1/30 P(2 and. Bellwork You roll a fair die one time, find each probability below. 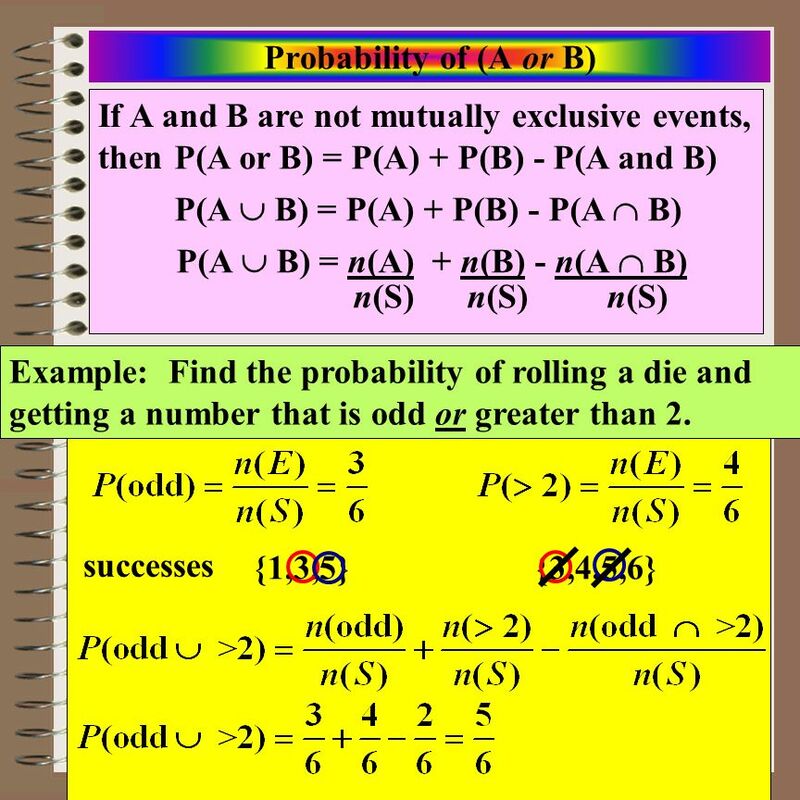 Probability and Conditional Probability. Probability Four balls What is the probability of choosing the ball in the red box? Since there are four balls. Probability Part I. Probability Probability refers to the chances of an event happening. 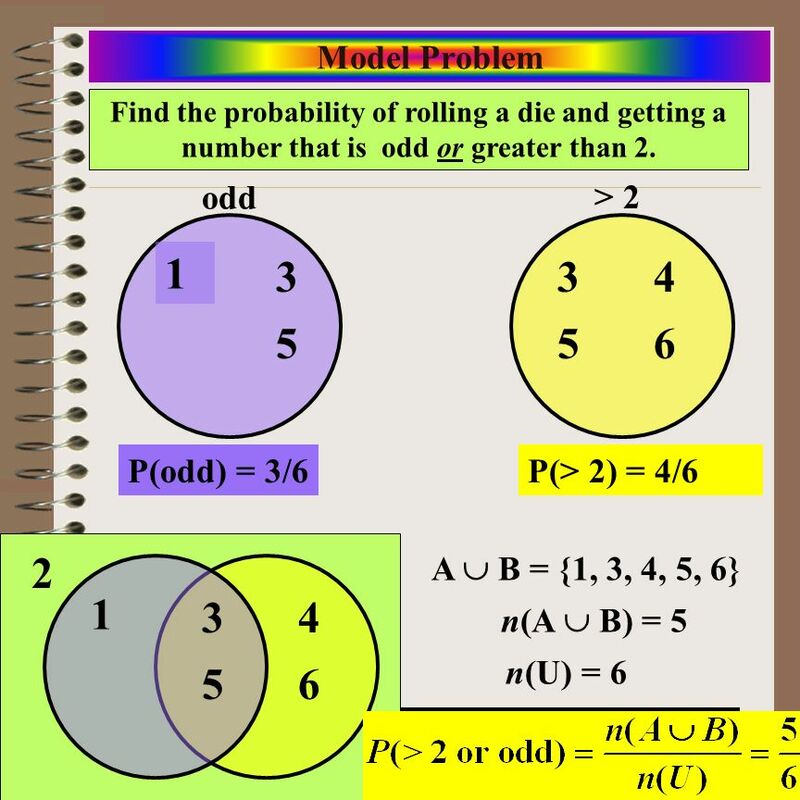 Symbolize P(A) to refer to event A.
Probability Presented by Tutorial Services The Math Center. 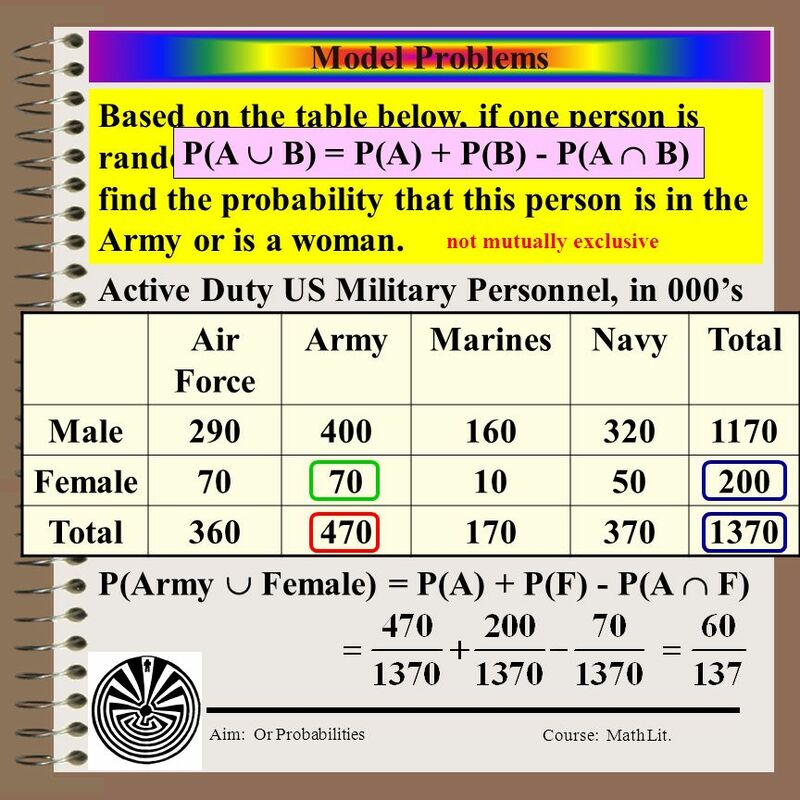 Lecture 18 Dr. MUMTAZ AHMED MTH 161: Introduction To Statistics. 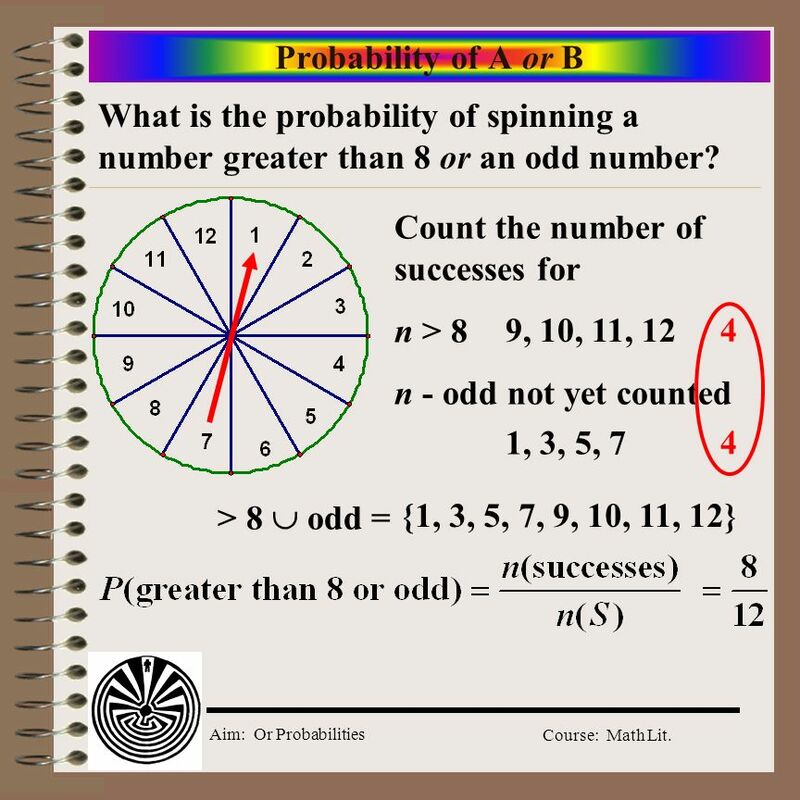 5-1 Chapter 5 Probability 1. 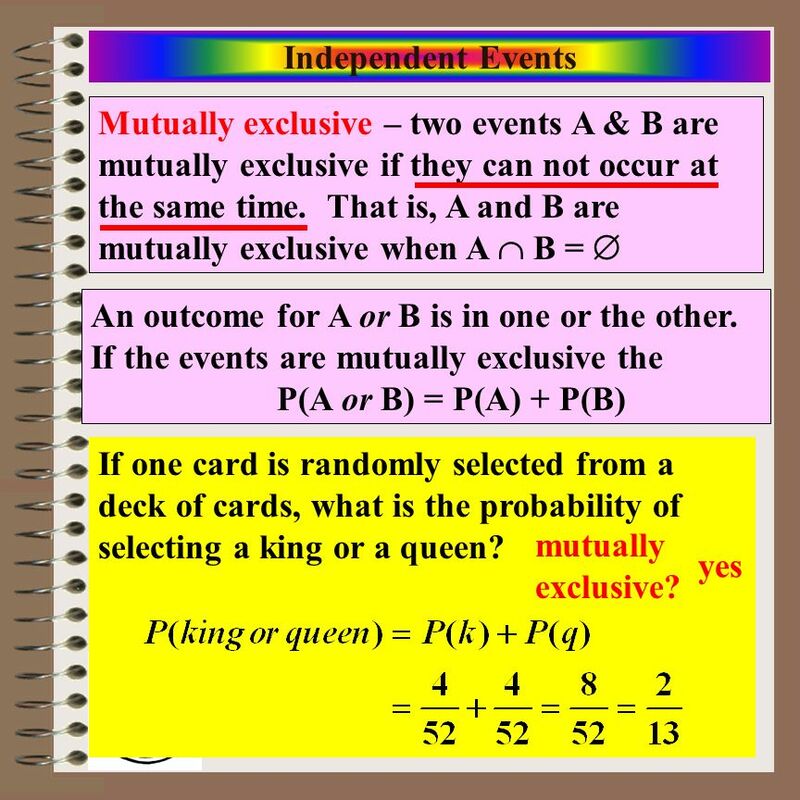 Probability: Mutually Exclusive Events 1. There are 3 red, 4 black and 5 blue cubes in a bag. A cube is selected at random. What is the probability of. Probability Key. You are given a standard deck of 52 playing cards, which consists of 4 suits: diamonds, hearts, clubs, and spades. Each suit has 13 cards. Business Statistics: A First Course, 5e © 2009 Prentice-Hall, Inc. Chap 4-1 Chapter 4 Basic Probability Business Statistics: A First Course 5 th Edition.